How does the district set class sizes? The district has worked hard to make class size a priority. We utilize the funding provided by the state to ensure that students are in classrooms that are at or below the size the state funds. The district prioritizes smaller class sizes at the youngest grades, where research shows the most impact. While not every section of our K-5 classes have been below the average, the districtwide average class size across all sections at each grade level has been below the stated goal every year since 2014. Average class sizes in the 2017-18 school year for Kindergarten were 19.63, for first grade they were 21.50, and for 2nd grade they were 22. Class size has been a priority in the Washougal School District (WSD) for some time. The Washougal Association of Educators (WAE) and WSD Collective Bargaining Agreement (CBA) sets goals for class sizes. If the number of students in a class exceeds the contract goals, there are remedies such as, additional compensation or support by a paraprofessional. While not every section of our K-5 classes have been below the average, the district wide average class size across all sections at each grade level has been below the stated goal in the CBA every year since 2014. In a district our size, it would be burdensome to our students and families to try to perfectly average class sizes between the four elementary schools so that every section is below the goal. Hiring an additional teacher to resolve overload for one or two students at a grade level is an incredibly expensive proposition, with each teacher costing an average of $89,000 when factoring salary plus contractually obligated benefits. The contract provides other remedies, including blended grade classrooms, providing paraeducator supports or overload pay, which are much more sustainable. This year and in previous years, the district has provided additional teacher support staffing when multiple grades are in overloads in a school. This support allows the principal to work with school staff to provide supports in English/Language Arts, Math or other core subjects, allowing additional personal attention for students when learning these important subject areas. These teachers are shared across grade levels in a way that is sustainable and helps remedy the overload. In the tables linked below, you will find a comparison between the goal numbers outlined in the contract and the current average number of students per elementary classroom for the 2017-18 school year (Table 1). If you would like to review the data from the previous three school years, Table 2, 3, and 4 have that data. All four tables linked above are available here in one printable pdf. Is Turnover in the Washougal School District a Problem? Attracting and retaining high quality teachers is a priority for WSD. We have hired 7-8 new teachers in the areas of art and P.E. to extend the elementary school day. These are not replacement positions, but new teachers. Seven teachers retired last year and were replaced with experienced high quality teachers. Why is the increase not 26%? The District has always viewed the above three categories as the “total compensation” for a teacher because at the end of the year, this is the money that will have been in a teacher pay check. 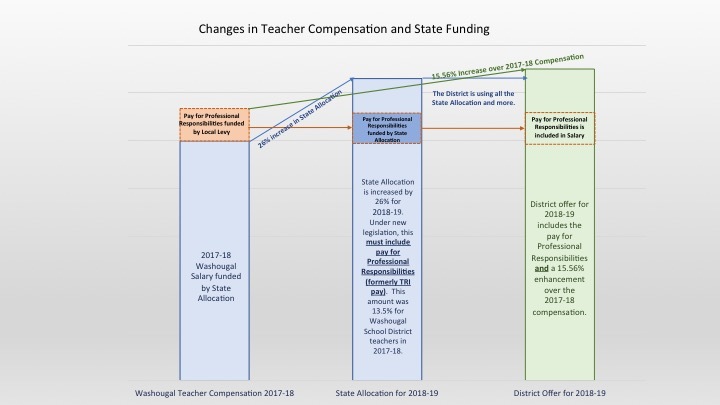 What did the district do with the 26% increase from the State for Teacher Salaries? The district is using every dollar given by the state, and then some! The base pay was increased by 26% but other forms of compensation were not included in this increase. For example, the district had used local levy money to fund the 13.5% TRI pay which teachers received as part of their total compensation, and now the state does not allow us to do this. TRI pay, for the additional teaching responsibilities is now included in this “new” base pay that the state is funding at 26%. In other words, TRI pay did not go away, it was included by the state into this “new” base salary increase of 26%. With this new McCleary model, the District is not allowed to collect levy dollars to pay for TRI because the state says that they must pay for TRI so that they can verify that they are fully funding basic education. The only additional levy-funded pay we may offer is for “documented” and “demonstrated” enrichment activities that are outside of the professional responsibilities of a teacher. That is why we can offer extra professional development days to our teachers and use levy money to pay these days. Another way of saying this is that the base salary was increased by 26%, but the reduction of the 13.5% in TRI funding created a total net improvement for teachers of about 12%. While the state increased the funding for teacher salaries, it capped property taxes as part of the levy swap, resulting in decreased levy funding that had been used to pay TRI. What is the Total Compensation increase that the district is offering? In order to fund a salary increase that is more than what the state gives us for teachers, the district projects that the reserve fund percentage will go from about 16% to around 10% over the next 4 years. 10% is the state average amount districts have in reserves. This demonstrates a commitment to making sure that we are attracting and retaining the highest quality teachers for our students. 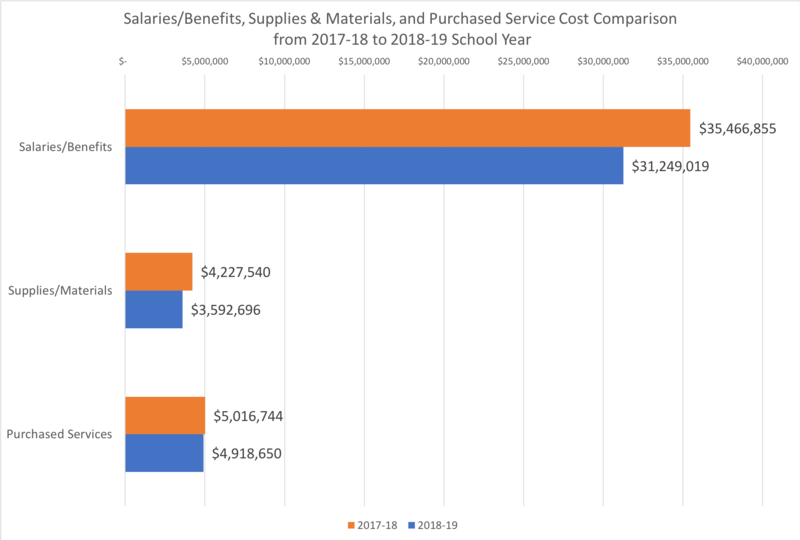 The chart below, from the presentation shared during the board budget presentation on 8-14-2018, shows the growth in total salary and benefit costs from 2017-2018 to the 2018-19 school year. Note that the vast majority of the cost increases in our budget are in the salary/benefit column, which will grow by over $4.2 million with our offer to WAE. Why are district reserves high? The school district used funds in the reserves, or ending fund balance, to ensure the construction projects could be fully completed. The remainder of the reserves will be needed to smooth out a dip in state funding that starts this year and extends through 2022, as funding from the local M&O levy drops off and is not fully replaced by the state. 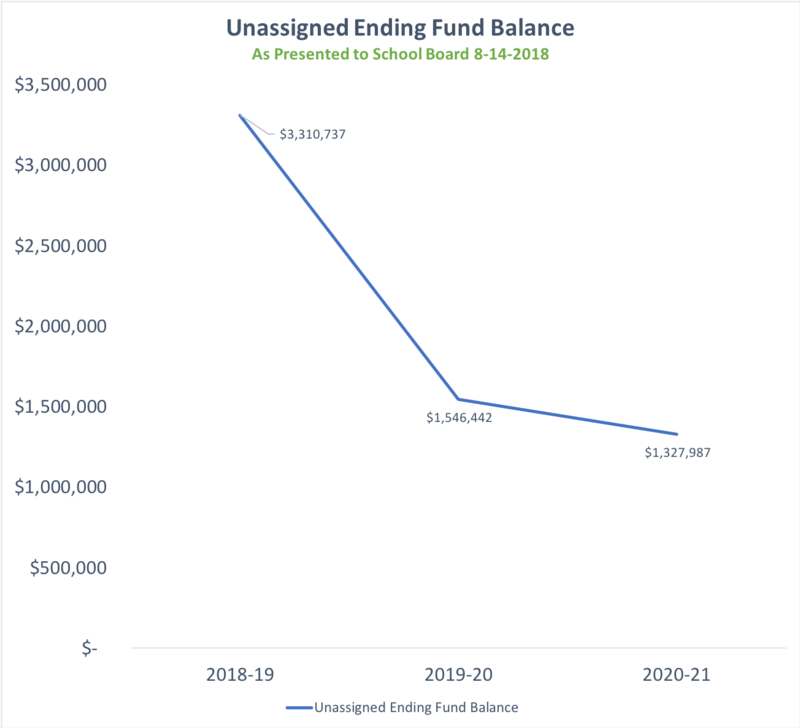 The district will spend the reserve down from it’s approximately 16% current level to around 10% in 2022, which will bring it into alignment with the statewide average for reserve funds.